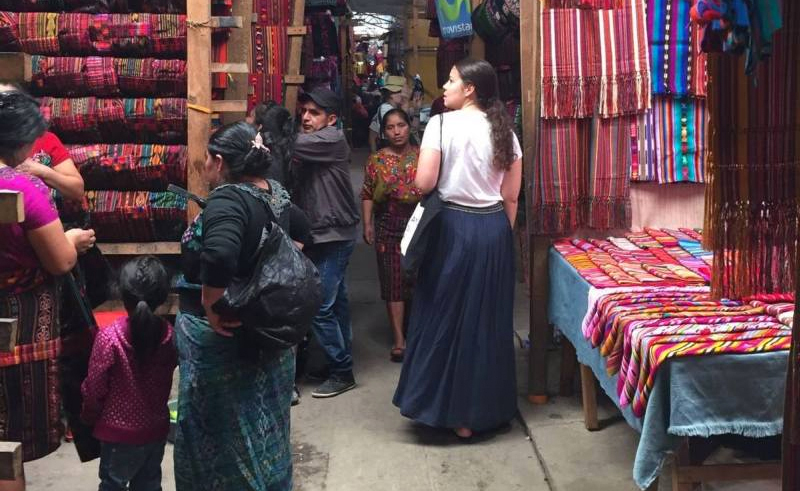 Kering employee Elleore Bomstein wandering in Guatemalan markets during her Nest mission. Nest is pleased to offer a series of exciting missions hand-curated for Kering employees. Each solidarity fellowship will place you directly with an artisan business in India, Indonesia, Guatemala, Cambodia, Laos, or Peru, where you will have the opportunity to work side by side with artisans to guide them through key business hurdles they may face. By taking part in a Nest mission you will expand your understanding of global industry supply chains, explore new locations and cultures, and channel your professional skills and experience for good. Placements can accommodate between 1 and 2 Kering participants at a time. Ready to go on Your Mission! Step One: Be sure you have registered with the Kering Solidarity Leave form. Register here. Step Two: Once you have completed and submitted the Kering Solidarity Leave form, you can register for your Nest Mission. Click here to apply. Read about some past Solidarity Leave Projects by your Kering colleagues. Chloe Guillouet shares production management insights with Guatemalan artisans. Victor LeLeu from Gucci brings expertise to artisan business in Udaipur, India. Magda Tomaszewski and Sarah Lehleiter meet in Peru to share their expertise with Awamaki. The following outlines the types of projects you may work on as a fellow. These are based on the typical needs of an artisan business. Once you apply for a Nest x Kering Mission the Nest team will discuss your skills and expertise to match with a relevant project for an artisan business. At a minimum the matching and on-boarding process takes three-months. If you do not see an area that matches your skills and expertise, we encourage you to still apply. Artisans interested in building their international sales often lack visibility into the retail landscape of their target markets. Even when an artisan business has clearly articulated its customer profile, it may not understand how to reach this customer in new market territories. For this role, fellows will assist artisans in researching the retail landscape of one or two new geographies into which the artisan business is keen to expand. The fellow will work with the artisan to identify both the target customer and retail outlets, helping to draft language the artisan may use to solicit clientele. Many artisan businesses lack a clear understanding of overall brand identity and miss important opportunities to tell their unique story. For this role, fellows with a communications/marketing background will consult with an artisan business to a better home in on its most differentiating and compelling qualities, helping the business to set clear guidelines surrounding voice and tone as catered to its target audience of consumers. Ideally, fellows guide the artisan business in recognizing ongoing storytelling opportunities and ways to share its unique point of view across owned media channels like e-communications, website, and social media. Ongoing, sustained design innovation is an essential and often-overlooked contributor to artisan business longevity. Artisans who practice heritage craft and participate in the design marketplace must continually find clever ways to reframe their art and skill by applying craft to new styles that meet seasonal trends. From a social impact perspective, introducing new production processes into the supply chain helps artisan businesses create differentiated job roles and expand employment opportunities for artisans. For this role, fellows work directly alongside Nest’s artisan partners to design a capsule collection that emphasizes the unique techniques of the craft while simultaneously achieving a design that appeals to the global market and speaks to contemporary trends. This fellowship is perfect for a designer(s) who loves to problem solve and is capable of designing around production limitations. Artisan businesses are always looking to expand the skills of the network of artisans they work with. Many handworkers around the world may have handsewing skills and basic tailoring skills, but there is a need to build upon these foundations. This fellowship is perfect for designers or technical pattern makers that would like to be hands on in training artisans new skills. Understanding the product that is selling and the right pricing strategy is a key element to growth for many artisan businesses. A volunteer will work with artisan to analyze their current product range and develop strategic merchandise plans. They will also work with to explore the best pricing strategy. Upon completion of the project they will have trained the artisan team merchandise and pricing strategies so they can continue to use these skills for future planning. Due partly to geographic isolation and a lack of intel about international market trends or consumer habits, many artisan businesses struggle to successfully frame their products for their target markets. Furthermore, artisan businesses can find it challenging to articulate the unique qualities of their craft in a way that resonates with their retailers or end customers – such as describing the inherent value of the slight variations of handmade products (which can be perceived as product deficiencies). For this role, fellows will create a customized marketing plan replete with communication language that effectively positions an artisans business within the desired target market. While Nest Guild artisans generally possess extensive knowledge and mastery of their craft techniques, they often struggle with translating these skills into product design for the export market. By sharing your knowledge of design and product development, fellows play a fundamental role in helping artisan businesses to develop concepts and designs that can dramatically improve their product offerings. For this role fellows conduct onsite hands-on collaboration with the artisan business to specifically address the unique needs of the artisan business. Work covers the entire span of the design process from concepting, to sampling, to market delivery. Many artisan businesses have been in operation for years, but have grown organically and never translated their business strategy into a formal business plan. If you have experience in business strategy or financial modeling, a fellowship that supports an artisan business may be able to use your starting the drafting of their business plan. One of the strongest available marketing channels for artisan businesses is their brand website. In a very competitive global market, the website often provides the first point of contact with a potential buyer, making it critical that this be a place that feels professional, informative, eye-catching and engaging. For this role, fellows with experience in website design and development, as well as the flexibility and creativity to work with an artisan business often dealing with limited resources or knowledge in website development, will be tasked with making visible improvements to site structure, design, and flow, identifying simple fixes, enhancements and opportunities for storytelling. A key ingredient to selling product is to ensure is visually appealing to buyers. This project will support an artisan business in how they should visually display their products in stores, catalogs, or even at tradeshows. This type of project is perfect for individuals in marketing, design, merchandising or other creative fields. Great marketing and storytelling need the visual imagery to support the material. Artisans are in need of professional, high-quality photos. For this role, a volunteer with a background in art direction and professional photography will work the artisan to visually capture every aspect of their business from still life editorials, product imagery, and photos of artisan’s working in their environment. Plus, the volunteer will share knowledge on ways to style product for catalogs/lookbooks, website photos, and social media.